Eleven-year-old Chad Hatcher was only trying to get proof. No one would believe him without it. He'd spotted some men hauling suspicious looking rocks off a reef near his house in the Florida Keys, and he suspected that the shiny bits of metal embedded in the rocks were pieces of treasure from an ancient shipwreck site. It couldn't be a legal dive site; not that close to a protected reef. Coming up with a plan to stop the looters before they destroy the reef is simple . . . finding a way to get past his big sister, Georgene, is not. But when things suddenly go wrong, Chad, and his sister, must scramble for their lives through the backwaters of Sugarloaf Key--with no one to turn to but each other. 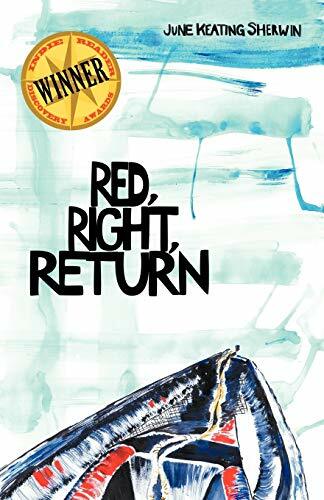 A fast, and fun, adventure that kids, adults, (and even reluctant readers) can't resist, Red, Right, Return keeps three things in mind: 1) exciting boat days on the water in the Florida Keys, 2) prickly brother-sister relations, and 3) ancient Spanish treasure. Yes, I'm obsessed with treasure. Isn't everyone? I fell in love with Florida (old conch house Florida, that is) as a kid reading books under the whirring Hunter fan on my Grandpa Jack's porch overlooking the Caloosahatchee River in Fort Myers. The bond grew stronger years later during long, and very exciting, days fishing and diving with my husband and children in the Florida Keys; and stronger still up in Indian River County where our house on stilts faced the Atlantic Ocean out the front door and the Indian River out the back. I didn't write for kids at first. Other than journals and stories for myself, for years, the bulk of my writing was for business. As a national account manager for technology companies, and later as a branch administrator, I wrote training programs, policies and procedures, and corporate communications; everything explained in exact order with precise detail. Phew. Then I got the chance to teach fifth-grade language arts at a wonderful school in Florida, where my students gave me the encouragement I needed to write a story just for them. Aiming for a fast and fun adventure (that kids, adults, and even reluctant readers couldn't resist), I wrote Red, Right, Return with three things in mind: 1) exciting boat days on the water in the Florida Keys, 2) prickly brother-sister relations, and 3) ancient Spanish treasure. Yes, I'm obsessed with treasure. Isn't everyone? These days I live with my husband in Atlanta, GA where I stay busy substitute teaching and leading kid's writing workshops while I work on all sorts of writing projects along with the exciting sequel to RRR.